After taking part in season five of the popular Where Are We Going, Dad? 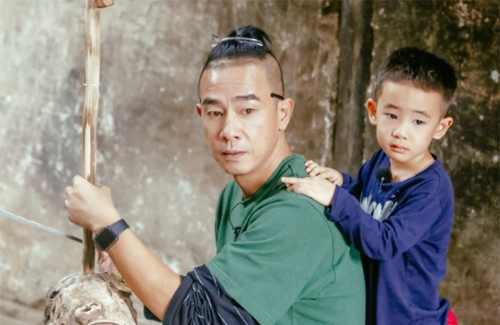 <爸爸去哪兒> variety show, Jasper Chan, son of Jordan Chan (陳小春) and Cherrie Ying (應采兒), has become a sensation among Chinese media and viewers. Along with having his own fan base now, Jasper’s newfound recognition has also boosted the popularity of his father. Currently, Jordan is busy preparing for his upcoming concert, which is set to start on May 5, 2019 at the Cadillac Arena in Beijing. At a recent event, Jordan was asked whether he would have his five-year-old son make a guest appearance on stage. Perhaps afraid that all the limelight will affect Jasper’s upbringing and childhood, Jordan will not have his son join him on stage. The 51-year-old entertainer feels that it is important to expose Jasper to nature and the outdoors, believing it would help tap into Jasper’s potential. At a young age, Jasper was encouraged to explore outside and discover the world. I doubt Jordan is worried about the spotlight affecting his son’s upbringing if he had stuck him on Chinese variety show for big money at the age of 4 or 5. Aww.. Jasper looks exactly like his father Jordan.